The seeds of Nicola's filmmaking career were probably sown in a childhood watching documentaries with her Grandad and having a fascination with music video. Combine this with an interest in English and becoming a storytelling documentary filmmaker was always on the cards. After a start with drama production Nicola knew factual filmmaking was more her thing and having switched she hasn't looked back. 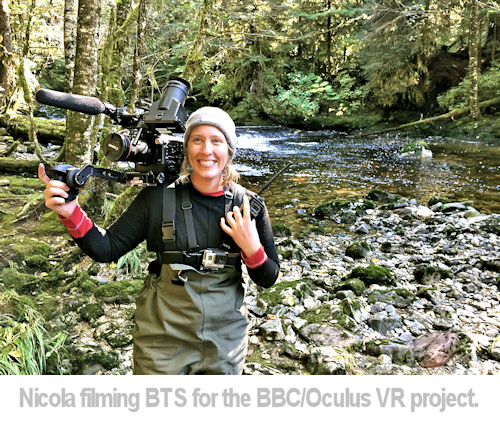 In our interview Nicola tells us how her career unfolded, what a digital producer does and about her latest work with virtual reality filmmaking. At school I loved the techy side to cameras and editing and the idea of being able to tell stories through a moving image. After studying Film, Television and English at Aberystwyth University, I knew I wanted to tell stories in some capacity but it took me a while to work out the path I would eventually pursue, digital storytelling. As many graduates do, I found myself back at home and taking the first job I could secure. After 18 months at a small marketing company in Lancashire I decided if I seriously wanted to pursue a media based career I’d need to re-locate. Through a university friend I heard about an opportunity in the drama office at BBC Wales in Cardiff. In the space of one week I interviewed, was offered a two week contract, bought a car and decided to give it a go. Little did I know this was the start of a six year journey in Wales and would open up opportunities to work on dramas like Doctor Who and landmark natural history series like Human Planet. My path to digital has been a varied one and I’ve had the opportunity to work across projects including BBC documentaries and factual features; drama; entertainment; children's and live events. My first digital project was as a researcher on a YouTube channel for the BBC called Earth Unplugged and from here I’ve worked on several digital initiatives including an online adventure series for Channel 4, an art project for Arts Council England/YouTube, a digital project around a BBC documentary on Koko the gorilla, a VR project for BBC/Oculus and my current role is on a long lead digital project called Our Blue Planet which will run alongside upcoming series Blue Planet 2. I think working on such a variety of projects and having television experience has been really valuable for the work I’m doing now in the digital space. Do you have a formal filmmaking education? I always enjoyed English at school and decided to pursue a joint honours degree by combining it with Film and Television studies. I loved my course but my advice to anyone wanting to pursue a career in media now would be you don’t necessarily need to have a formal filmmaking education. I’m currently work at the Natural History Unit for BBC Earth and many of my colleagues pursued science studies and learnt the craft of filmmaking further down the line. What prompted you to pursue this as a career? I was obsessed with music videos when I was younger, the freedom to be unlimited by creativity in both picture and story. I guess that’s one of the reasons I fell in love with digital storytelling, it’s a constantly changing landscape that’s open to creativity, new ideas and approaches to story. As a child I also adored watching nature documentaries with my grandad, I would’ve never believed that’s where I find myself working many years later. How did you land your first professional assignments? I got my first break via a university friend who told me about an opportunity at BBC Wales. I'd be planning to move to Birmingham and had a place in the BBC runners pool which essentially means you might get a call if they need someone. But a few days before the move I was given an opportunity in Cardiff. They were launching a Doctor Who spin off drama called Torchwood and needed a runner to help the brands team. As well as getting plans in place for an event I was tasked with calling invited guests to confirm their attendance. Some were well known which was a little daunting and I was mortified to accidentally wake up British actress Catherine Tate who was asleep in New York! Thankfully this didn’t impact on my BBC career and from here I moved onto to work on a series of Doctor Who related projects before the drama itself. This was a fantastic learning curve (and I got to be an honorary dalek!) but after a few years I realised drama wasn’t the path I wanted to pursue and switched to factual. My first assignment here was as a team assistant working across documentaries and features about art, science and history. From here I would work on my first natural history project, Human Planet and landed my first ever editorial role on a BBC Four documentary about the Human Planet Prom at the Royal Albert Hall. Describe your career up to working for the BBC. I worked for a small family run marketing company that had nothing to do with media. I feel very fortunate that my first career break was for the BBC. You describe yourself as a digital producer, can you tell us what a producer does? The digital producer role tends to change based on the nature of a project. For example working across a social media campaign has a slightly different skillset to working across a game or a VR production. And that was part of the appeal for me in pursuing this path, the opportunity to be multi-skilled as opposed to the more linear skillsets found in television. I’m currently working on the first project of it’s kind at BBC Earth, a long lead digital production running alongside a big television series. I manage a small team to create short-form content that ranges from videos and 360 content to articles and a social campaign. Where possible I love the filming process and being hands on with kit. 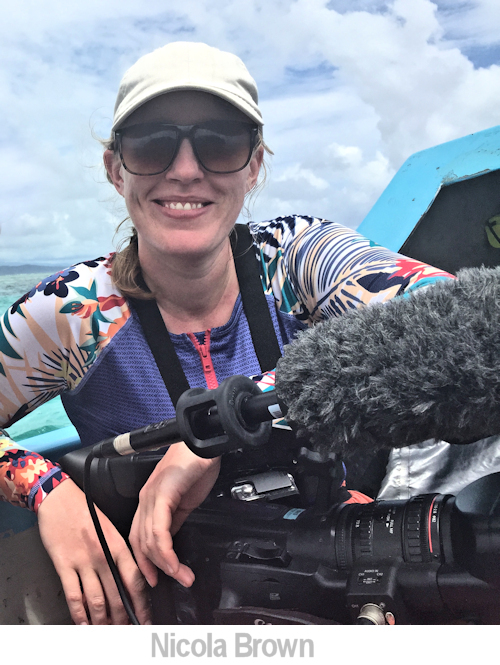 Over the past eight months I've had the opportunity to film 360 video and short films on location in British Columbia, the Solomon Islands and Borneo. My role also includes idea development, scripting, directing and edit producing. I also feel it’s important to help develop the skillsets of my colleagues and spend time supporting them in areas they want to progress in. With all our digital content at BBC Earth we hope to tell natural history stories in innovative ways and to reach new and younger audiences online. So I also do my best to keep one eye on digital content across all kinds of broadcast and to get a sense of what audiences like about short-form any why. How did you find working alone on single-shooter projects? I’m happy working alone but much prefer being part of a team. 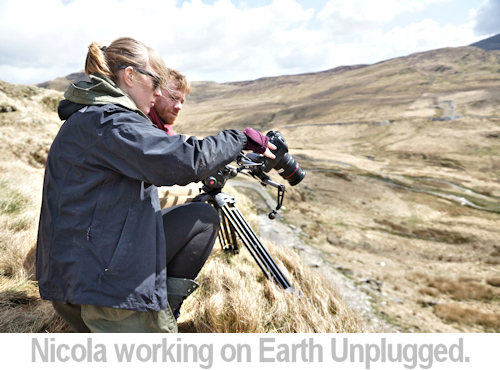 When I worked on the BBC YouTube channel Earth Unplugged the same team worked together for over a year. In the full swing of production we worked so well together and in my mind, that benefits a project so much. When you all collaborate and inspire each other it builds ideas so they become stronger, and allows everyone to learn and progress. Is working with a team on a production easier or harder? "I think VR is an incredibly exciting medium and we’re only just starting to see where it works and where it doesn’t." What kind of work are you producing? Currently I’m working across short-form that tells stories about our oceans. The project is called Our Blue Planet and is running alongside the upcoming television series Blue Planet 2. The content we’re making sits across Facebook, YouTube, Instagram and Twitter and includes short films, 360 video, social posts, and written articles. The hope is to reach new audiences with ocean-based content that’s inspiring, educational and immersive. Along with our partners on the project Alucia Productions, we hope to innovate in digital approaches to telling natural history stories online. I’m freelance and have also enjoyed working across art and music related projects. I’m hopeful I can combine both science and art on this current production. Tell about a typical working day? Currently my role is mainly office based and my time is split between creative development, overseeing edits, establishing working relationships with organisations we’re keen to partner with and ensuring our schedule and budget are in check. Over the coming months that will change slightly as we get on location to film some ocean based stories. On location I’ll be responsible for directing the shoot, for safety and ensuring we’re on schedule and delivering to the brief we set out to capture. What are the highs and lows of filmmaking for you? I love the variety film-making offers; especially in digital. One minute you can be telling a story about the biggest animal on the planet and the next, a piece about musician or an art project. I love the limitless opportunity for creativity in the digital space but coupled with that, things change so rapidly that at times it can prove challenging to keep up. When platforms like Facebook and YouTube change the dynamics of their platforms it can have a huge impact on the options for telling stories. 360 video and live streaming are good examples of that. Advances in technology also have an effect on what’s possible in terms of capture; something that’s changing rapidly in 360 and VR. I worked on a BBC/Oculus project last year and in some respects the set-up we utilised already feels a little dated. And it was only 8 months ago! Keeping on top of trends when they change so quickly is also important. Another great thing about being part of a team is that it’s possible to share these learnings and all take steps forwards together. You’re now working on VR projects, how different are these to normal filmmaking processes? VR and 360 video capture is incredibly different to the usual filming process, especially in natural history when animal behaviour has it’s own challenges. Traditional cameras have long lens which makes it possible to capture animal behaviour from far away. 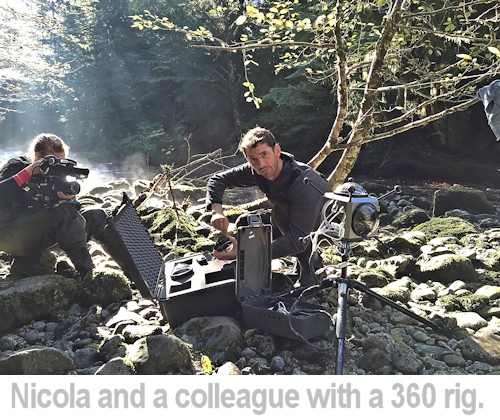 That's not the case with a 360 rig and for the experience to work, the cameras need to be as close as possible to the subject without disturbing them. On top of that you’ve got six cameras to keep charged, dry and clean. Not an easy feat in remote locations. In underwater filming there’s another level of consideration such as the risk the rig might flood or, you won’t capture the behaviour you were hoping to because the animals are tricky to find or the visibility isn’t ideal. And unlike traditional filming you can’t edit together detailed shots to build a sequence, instead you’re essentially filming a collection of wides which you can weave together to form a narrative. It’s a completely different way of thinking. And funny that you find yourself having to hide from the cameras! What are your thoughts on VR as a medium? I think VR is an incredibly exciting medium and we’re only just starting to see where it works and where it doesn’t. The pace at which technology is moving for both capture and viewing is incredible and I think in another 1-2 years it will feel hugely transformed from where we are currently. I’ve been lucky to be part of natural history teams who are exploring the application of 360 experiences and will hope to continue to do so. But for me the most exciting areas to watch develop in this field are gaming and the idea of utilising VR in hospitals to aid recovery or to offer an escape to patients. Not to be afraid of networking and putting yourself in front of people who work in parts of the industry you want to work in. Speaking to as many people as possible can not only help you to learn and develop but can open doors and avenues you might have never known existed. I don't like to feel I'm pestering people and when I started out would shy away from putting myself out there. This advice helped me a lot. Do you have any advice for anyone wanting to break into filmmaking? If you know which area of the industry you’d like to work in think about all the skills you need to get there and find a way to develop them. If you don’t quite know which path to take, think about what you enjoy most and talk to people who work in those areas. I’d also say be open to criticism and feedback as it will help you develop but at the same time, keep in mind that sometimes when it comes to editorial comments, these can be subjective. It took me a while to learn this and it’s helped me to know which feedback to listen to and progress from. All images © Nicola Brown and used with permission.